Tajuya is an ancient settlement of La Palma, the name comes from pre-Hispanic times. It is located about halfway between El Paso and Los Llanos de Aridane. The nearest beaches and the forest are only a few minutes drive. The house Tajuya N ° 12 is not built by Guanches, but has been around for almost two centuries. We have completely renovated it and extended it to a small bathhouse. A bathroom according to today's standard did not know the ancestors here. Recently, a washing machine is available. Bedroom with double bed, on the first floor a spacious living / bedroom with two single beds that can be put together and a large sofa bed. At right angles to the main house, the kitchen house is grown. Fitted solid wood kitchen, gas stove, XXL fridge / freezer, dishwasher and a comfortable seating area with corner seats invite you to cook, eat and linger.Directly in front of the two houses are tables and chairs for outdoor living. A brick barbecue and lush greenery complete the whole thing. The view goes over the village to the sea. A few steps above the natural stone paved courtyard lead to the bathhouse with shower, sink and toilet. 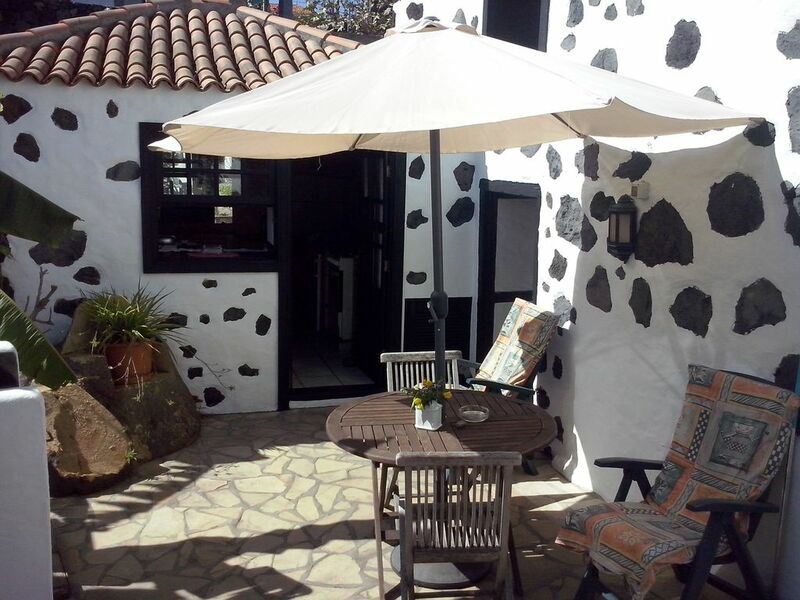 The "special features" of the Casa Dálmatas include satellite TV, a DVD player, a small stereo with USB and Bluetooth and a WiFi router for unlimited access to the Internet. During the renovation, great care was taken to preserve the original character of the buildings. This means that z. B. also the old wooden floor between living room and bedroom was received and the masonry remained partially visible.In the neighborhood are within a few minutes on foot Local with local, Italian or international cuisine. Shops can be found in about 2 km away, a bus stop in about 150m.Two persons pay € 45 per night, additional adults € 5, children up to 14 years € 3. Babies and toddlers up to three years are free. For laundry and final cleaning we do not charge anything extra !!! Immediately: The Dalma is now WiFi zone, no extra charge !!! A large 80 liter electric water heater provides them always with enough warm water. No hassles with empty gas cylinders! Washing machine! Urlaub in originalem kanarischen Haus.Trasse mit Meerblick und Sonnenuntergang. Ruhige Lage und freundliche Nachbarschaft. Toller Vermieter! Alles wie auf Fewo beschrieben und den Fotos entsprechend. Wir hatten eine schöne Zeit! Wir hatten einen tollen Urlaub dort, alles prima. Dass die Finca aus verschiedenen Häuschen besteht hat besonderen Charme. Kann allerdings auch kühl werden, mit angemessener Kleidung aber ok.
Hat uns sehr gut gefallen in dieser Wohnung. aber dank sei einem Gas-Ofen, den wir abends für einige Zeit anhatten, ging das auch. Die Wohnung ist urig und man fühlt sich direkt wohl. Babybett war da, ein paar Spielsachen für den Strand gab es auch, Hochstuhl auch. Alles sauber. Es gab eine Waschmaschiene und Geschirrspüler. Vielen Dank für die nette Zeit in Deinem Haus. ... man braucht aber schon ein Auto. The settlement Tajuya belongs to the municipality of El Paso, but is immediately adjacent to Los Llanos. Therefore, the winter half of the year rather fresh mountain climate is much less pronounced. The central location of both the beaches and the forest and the mountains are within a few minutes. Also, all major shops in the local area. The middle layers, the so-called. 'MEDIANIAS', the vegetation all year round green, dense, infinitely many flowers there all year round. In January and February, offers the unique almond blossom. Wir sind was die Bezahlung angeht nicht päpstlicher als der Papst, arbeiten aber Vertrauen gegen Vertrauen. Der Mietpreis versteht sich für Belegung mit zwei Personen, zusätzliche Erwachsene zahlen € 5 pro Nacht, bei Kindern sind wir durchaus "flexibel" :-) . Ein Tagessatz wird für Wäsche und Endreinigung zusätzlich berechnet.